Moving offices to a new facility, expanding, or consolidating? JR-Tech is ready for any migration. We will assist in the planning of your new IT infrastructure, coordination and scheduling, and the migration of your IT equipment (servers, desktops, printers, network devices, etc.). 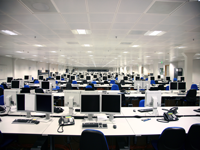 You can trust that all your IT systems will be ready to work after your workplace migration. We will fully inventory your entire network, manage all steps of the migration, and completely test all systems after the migration is complete.